“Milan meets Tuscany”; old-world elegance and Italian sophistication meets rustic, comfortable farmhouse/barn. 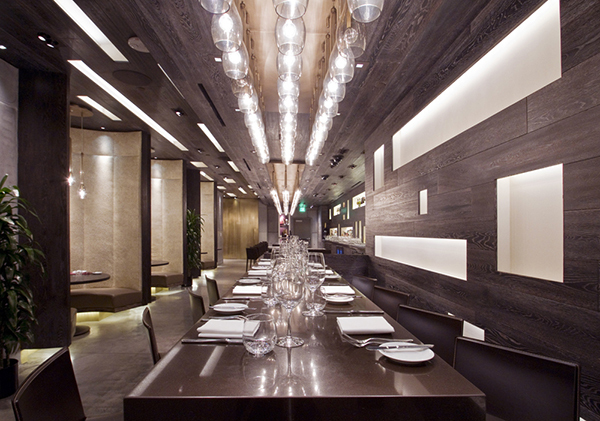 Playing of contrasts in a subtle and nuanced way to create a simple yet dramatic setting to complement the food. During the daytime the natural light streams in and creates a relaxed, cosy lunchtime atmosphere. At night the central chandelier comes to life and becomes the main focus in a theatrical food setting, with candlelight and shadows creating an intimate mood. We wanted our diners to feel at ease and comfortable in a relaxed yet refined setting, in order to fully connect with the food and each other.